Sergei Krikalev is a retired Russian cosmonaut who holds the record for the cumulative amount of time spent in space. He became the new record-holder on August 16, while serving as commander of the International Space Station, when his total of 748 days logged in orbit surpassed that of Sergei Avdeyev. Krikalev, who was born in Leningrad, won the top national prize for daredevil aerobatic flying in 1986 and later received numerous international honors, including "Hero of Russia", for his spaceflights. He flew twice to the Russian space station Mir – once staying on for back-to-back six-month tours when one of the subsequent two flights to Mir was cancelled. 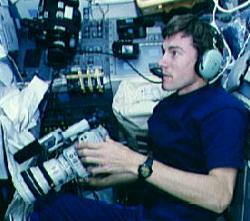 He also flew on the first joint US-Russian Space Shuttle mission in 1994, the first mission to assemble the ISS in 1998, and was a member of the first crew to live onboard the ISS in 2000.